team up for a new monthly event at Poleng Lounge in San Francisco, CA. Both collectives have produced events all over the Bay Area since 2004 and are taking their eclectic variety of live music and community back to the Poleng Lounge this fall every 2nd Thursday of each month. Expect a cross-pollination of live bands and electronica bands with live elements. 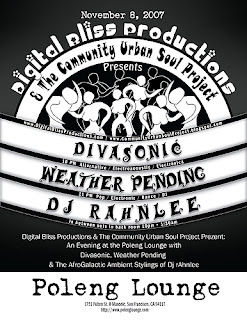 However mixed the Poleng Lounge will be it will emphasis electronica with a monthly residency from Divasonic (Live ~ Electro - Acoustic - Drum & Bass) and a bi-monthly residency from BOMANI (Live Hopadelic Funk & Soul). Including a rotation of three spectacular DJs; DJ Fridaylove, DJ Big Willie and DJ rAhnlee. DJ Fridaylove spins ‘Oakland Big Beats’, DJ Big Willie spins “Everything Funky” and DJ rAhnlee is a Laptop DJ who produces and plays his Afro Galactic ambient music. · The Community Urban Soul Project (C.U.S.P.) began in 2004. CUSP aims to raise both awareness and funds for specific community issues and needs, and build a stronger artist community and community in general by showcasing musicians of many genres. The members are creative folks; teachers, actors, counselors, doctors, etc, who are involved in community outreach on many levels. These groups work together to share music as a tool to build community. Digital Bliss Productions was established in 2004 to promote women electronic music producers, vocalists, instrumentalists and engineers as well as women who combine media and disciplines to create their own unique voice in the digital realm. Digital Bliss seeks to connect groups in the wildly varied Electronic music scene to create more community and cross-pollination in the Bay Area and subsequently on a Global Scale. Through performances, education, touring, compilation releases and blogging we share our new voices and music. Both collectives have produced events all over the Bay Area since 2004 and are ready to bring their eclectic variety of live music and community back to the Poleng Lounge this fall every 2nd Thursday of each month. Expect a cross-pollination of live bands and electronica bands with live elements. However mixed the Poleng Lounge will emphasis electronica with a residency from Divasonic, DJ Fridaylove and DJ Big Willie. 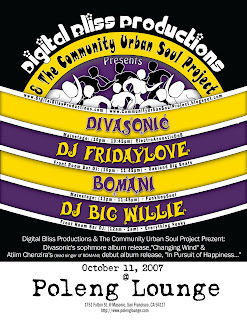 DJ Fridaylove spins ‘Oakland Big Beats’, DJ Big Willie spins “Everything Funky” and BOMANI plays live Funk/Hip Hop/Soul. The Community Urban Soul Project (C.U.S.P.) began in 2004. CUSP aims to raise both awareness and funds for specific community issues and needs, and build a stronger artist community and community in general by displaying musicians of many genres. The members are creative folks; teachers, actors, counselors, doctors, etc, who are involved in community outreach on many levels. These groups work together to share music as a tool to build community. Digital Bliss Productions established itself in 2004 to promote women electronic music producers, vocalists, instrumentalists and engineers as well as women who combine media and disciplines to create their own unique voice in the digital realm. Digital Bliss seeks to connect groups in the wildly varied Electronic music scene to create more community and cross-pollination in the Bay Area and subsequently on a Global Scale. Through performances, education, touring, compilation releases and blogging we share our new voices and music. Click the image and set up an account. This is one of the best resouces I know. If you travel you can benefit from this. If you want to collaborate or ask questions amongst your peers... This is for you.